Happy New Year... Prospero Ano! 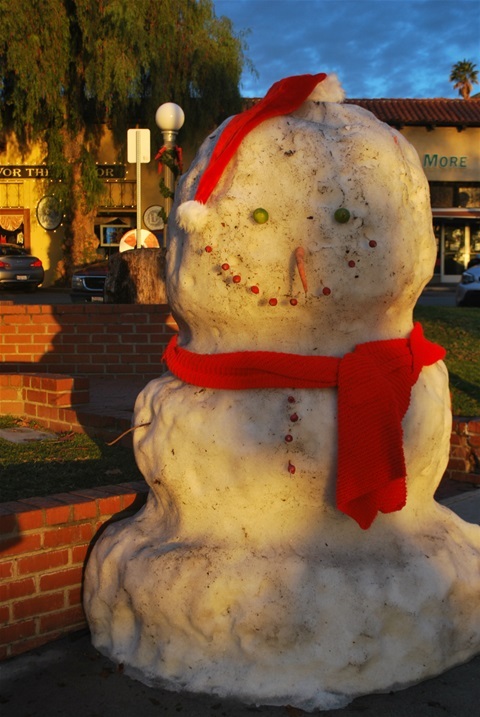 The Sierra Madre Snowman is huge this year and, as it’s cold, he’s stayed in good shape for several days. He’s quite handsome, too! I’m never sure who to thank for that guy, but whoever you are out there with very cold hands, thank you! This coming Sunday is the first day of 2017. Hard to believe. Looking back over the past year, we think it was pretty good. Hope yours was, too. We went to more baby events and children’s birthday parties than funerals, but we mourned the loss of several dear friends, who will stay in our memory forever. Many people like to start their New Year’s with black-eyed peas, a Southern tradition for good luck and prosperity, but my family likes to kick off the New Year with Split Pea Soup. Easy to make, do it ahead of time, and if you’ve planned ahead, you can make enough to keep hungry teen-agers happy all day long. You can double and triple this recipe with great success, if your pot is big enough. 4 ham hocks (usually packaged 2 to a package in the meat section) or a ham shank, or the ham bone left over from Christmas. 3 medium-size onions – actually there’s no such thing as too much onion! Get out that really large pot and put the ham hocks or the ham bone in the bottom. Throw the peas on top of that, followed by the onions, carrots and celery which you’ve washed and cut into big chunks. Cover all this with water, or a combination of water and chicken broth. Say about 8-12 cups of water. Season with salt and pepper and whatever else you like. If you’re partial to thyme, put some in there. Or Mrs. Dash. Cover your pot and put in the oven at about 300 degrees. Leave it in there for about six hours, or till the peas have become very tender. Take it out and let the mixture cool to where you can handle it without burning yourself. Take out the ham hocks or ham bone and set them (it) aside. Assemble your blender and blend your lukewarm soup/veggie mixture into a smooth puree. Put this into a large container with a cover, like your crock pot. When all your soup is pureed, remove whatever meat is on your ham hocks or ham bone, tossing out all fat and other non-meaty parts and put the meat back into your soup. Refrigerate. Let it sit for a day or so to develop flavor, reheat it and stand back so the hungry relatives don’t run over you as they rush to grab a bowl of the best split pea soup anywhere. You could make some cornbread or corn muffins to go with your soup and everyone who has some will love you forever, getting your New Year off to a great start! And may we seek God, read His Word....yes, dear friends...I have kept procrastination at bay and have read through my Bible this year. I will admit there have been a few periods of catching up, but I have done it and now it’s a habit and I’ll just start at Page 1 again next Sunday. And believe in miracles! Always believe a miracle can happen!